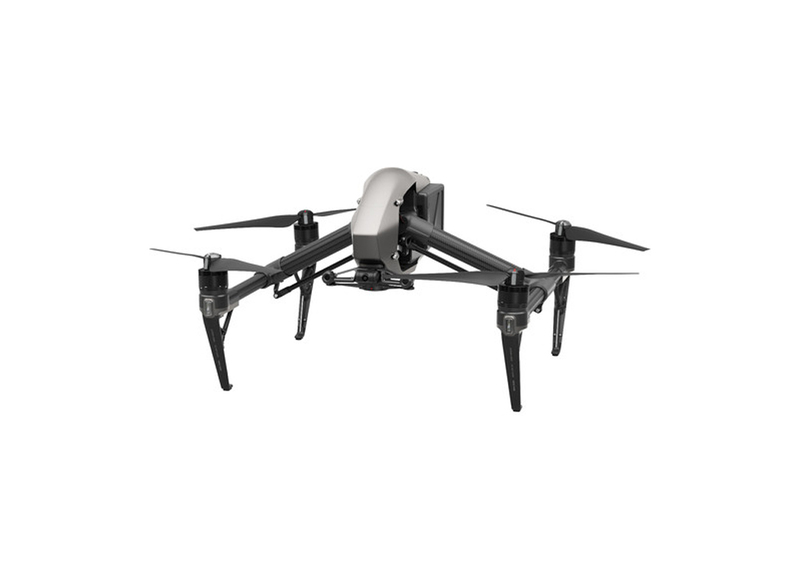 The DJI Inspire 2 is a high-end quadcopter with two cameras. The primary camera has an interchangeable lens and 5.2K video, while the second camera is used for purely for drone navigation. 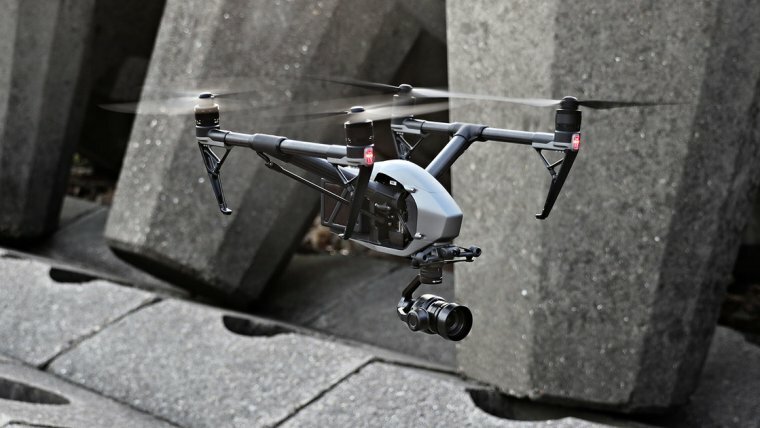 The Inspire 2 can reach the speed of up to 98 kph (58 mph). It can get as high as 16,400 feet or almost 5000 meters. How does that sound for impressive landscape videography? It is aimed for professional videographers and aerial photographers, as well as enthusiast consumers with some extra money to spend on a new toy. DJI are the leaders of camera drone industry, no doubt about it. The most popular high-end drones are usually DJI’s, either a Phantom or an Inspire. When the Inspire 1 came out, it was apparent that DJI is looking to provide a drone camera which would close down the gap between consumer and professional videography. Inspire 1 tried to do just that. It brought a high-end, high-resolution camera on a durable, stabilized, fast drone body. But while it is a formidable machine, it couldn’t quite match the versatility and image quality of professional motion picture cameras such as the Arri Alexa. The drone itself also lacked speed which is needed for recording fast-moving subjects, such as those in a high-speed car chase type of scenes. That’s where the DJI Inspire 2 comes into play. 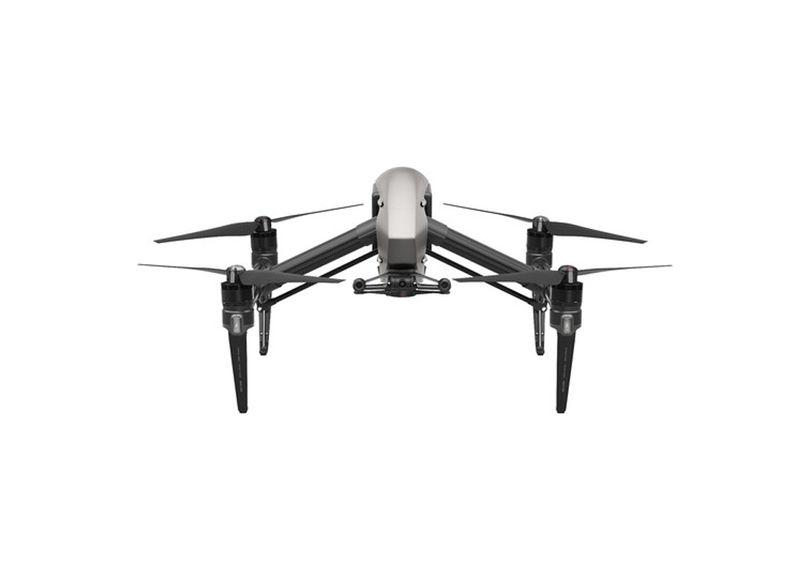 While the Inspire 2 looks much like the Inspire 1, it is an entirely different drone. The DJI made sure to rebuild the Inspire from the ground up, replacing and upgrading it to meet the highest standards provided by cinema professionals. We will start off with the design. As we already stated, it looks much like it's predecessor, with a few notable exceptions. Again, we have a mean-looking outer protective shell, spanning further in length than in width. If we let our imagination run a bit wild, we would say it looks like it came out of a future where Alien and Terminator had a child and called it Inspire 2. Compared to Inspire 1, it is slightly bigger and considerably heavier. Weight is measured at 3290g (7.25lbs) without the gimbal and the camera, with two batteries installed. Yes, the Inspire 2 has two batteries instead of one, although you can still use it with only one battery. We will talk about those a bit later. The outer shell is now made of magnesium-aluminum alloy with a matte finish, instead of glossy like we had with the original Inspire. Magnesium alloy adds to the sturdiness while not adding too much weight. Overall, it feels very, very premium. All four arms connecting the main body with propellers are made of carbon fiber, making them both light and resilient. The propellers are now also bigger, heavier and feel more solid, thanks to the carbon composite build. The same goes for the propeller engines. Even the joints are now made of magnesium alloy instead of plastic. In fact, looking at almost any part of the new Inspire, you will find it to be bigger and stronger and at the same time slick and polished. At the very front of the main shell, there is a front-facing camera we previously mentioned. At the rear, you will find the two batteries we mentioned. The batteries are extremely easy to install with a simple slide-in mechanic. They are completely exposed, however, sticking outside of the protective shell. Pulling them out is as simple as installing them, as they pop out much like a gun magazine at a push of a dedicated button. The batteries are self-heated, meaning that you won't have to worry about flying in low temperatures. While this is an advanced camera drone, it is at the same time the easiest drone to fly. We are very impressed with how much effort DJI has put in making the Inspire 2 simple to take off, fly and land. Once you get the drone out of the box, preparing it for flight takes only three simple tasks; Slide the batteries in; Snap the camera onto the gimbal; Pop on the propellers. Altogether it takes less than a minute for an experienced pilot to get everything set. The setup is super quick and easy. Everything that can be automated is automated. Even the landing gear uses onboard proximity sensors to automatically pull or pull down its legs while taking off or landing. Retracting the landing gear ensures you get a clear field of view while recording, with no visible obstructions. Though we did notice the propellers were visible at the top of the viewing field at extreme angles when the drone was trying to stabilize itself just before a full stop. There are also automated functionalities such as return home on demand. In this case, the drone will return either to a pre-designated home destination or just return to the operator. In case there is a danger of crashing for whatever reason, be it critically low battery, sudden loss of signal, it will not only return to the position of the operator, but it will also land automatically. It uses the secondary camera as well as proximity sensors to detect any objects in proximity which might pose a risk for crashing and avoid them accordingly. In case you want a close-up shot of something, this safety feature can be turned off. All these features add to safety, and security is of paramount importance with any sort drone flight. Actual handling is taken care by the in-box remote controller which offers two very responsive joysticks. Most settings are however handled by the official app, which you get to use by attaching your smartphone or a tablet onto the remote controller. The app performs great, we didn’t run into any glitches or bugs, and it is reasonably fast. There you will find all kinds of different settings to explore. You can manually change recording options, such as the resolution, output format, aspect ratio, frame rate, etc. You can even adjust the sensitivity of the controller for easier flying and framing. There is an optional second controller if you wish to use the Inspire 2 in tandem with another person. The second controller receives the video feed from the 2nd camera (more on that below). Note that the controllers have to be within 100m of each other for this to work. Yes, you heard that right, the Inspire 2 has two cameras! While the primary camera which resides beneath the drone attached to a gimbal serves for video recording and photography, the secondary camera is positioned more to the front of the drone and can be used by a 2nd user, a pilot, purely for piloting the drone. This way the filmmaker can focus on capturing the right composition while someone else handles the navigation. This camera is used exclusively by a 2nd operator for the purpose of navigation and piloting. The front camera is of lesser quality than the main camera and is not stabilized as well. It relies on a 2-axis stabilization system of moderate shake reduction, which does a solid but not complete job at making sure the footage stays steady. Its basic gimbal allows for the pilot to tilt the camera up and down at a 60-degree angle. Both cameras send an FPV real-time videos feed to two different devices. Both the front and the rear of the drone houses two optical collision avoidance sensors. This collision avoidance system detects incoming objects at a safe distance, ensuring you don’t accidentally crash your drone. It is especially useful when the drone is on auto-pilot, such as when returning home automatically. This system means a huge deal for overall safety. We already mentioned the new Inspire packs two batteries, which amounts to about 25 minutes of flight and recording time. That’s 5 minutes short of a double from the previous version, which could last up to 15 minutes. Both batteries come with the drone out-of-the-box, which is a genius move from DJI. Limited flight time is one of the core issues with camera drones, so this bump in battery power comes as a very nice upgrade indeed. Note that the maximum flight duration may be lower, or even higher than the specified manufacturer time. It all depends on how you use the drone and which features are utilized. The two batteries are not used at the same time, meaning once the first battery dies the other one kicks in. The obvious advantage of this is due to the possibility of a battery failing and having the other one ready to kick in as a reserve. The charger you will get with the package is designed to charge both batteries at the same time, which take about 90 minutes to charge fully. We recommend buying at least another two battery pack to have at your disposal. This way you will get just under an hour of flight time when you’re out in the field. The first thing you should know about the camera on Inspire 2, is that it doesn’t have one. Meaning, the base package does not include a camera. You will have to purchase it separately. What it does have, is an integrated image processor, the new CineCore 2.0. This is the processing power that makes it possible to record 5.2K resolution video. 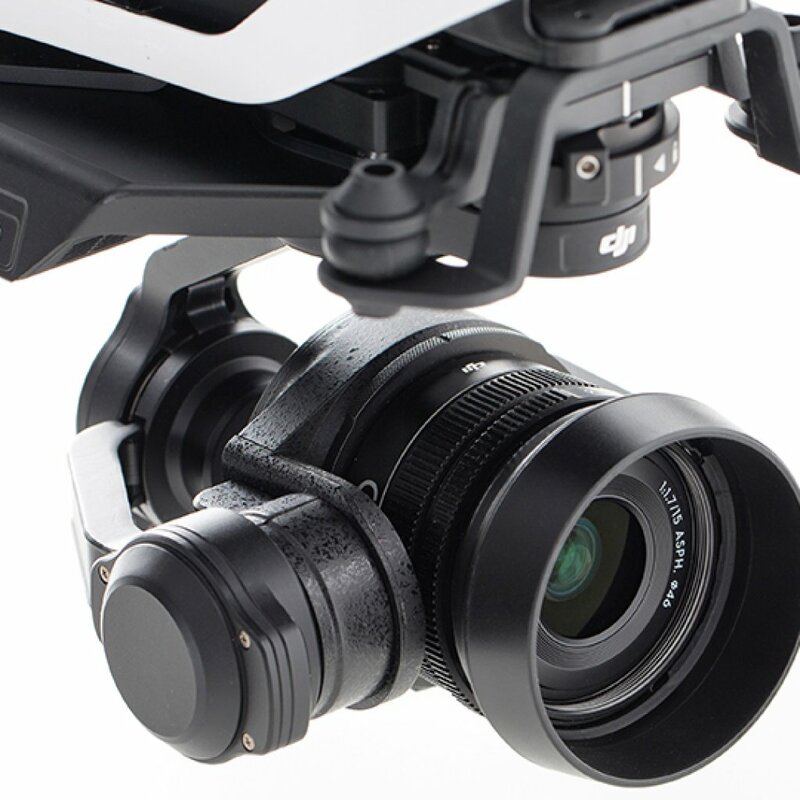 Right now, there are only two officially compatible cameras for the Inspire 2 drone. These are the Zenmuse X4S and X5S. The X5S is the more expensive and more capable variant and the chosen camera for our tests. Inside the camera, there is a Micro four-thirds 1-inch sensor with a dynamic range capable of 12.5 stops. Both cameras are 20MP with the difference being in the physical sensor size. The X4S has an ISO range from ISO100 – ISO12800, while X5S expands on that up to ISO25600. The X5S is an interchangeable lens camera. Unlike other drone cameras, this one allows you to change its lens and get different results. Instead of being stuck with a fixed focal length, you can choose the lens with the appropriate focal length depending on the situation. Most drones cameras feature the wide-angle lens, which is great, but what if you want to get a closer shot of something? With the X5S that’s not a problem, just attach telephoto lens for a larger optical zoom, and you are ready to go! The X4S is a fixed-lens camera, meaning no swapping lenses! As you can see, a wide range of focal length is covered. Everything between 9mm – 45mm (35mm camera equivalent: 18mm-90mm). For an aerial camera, that’s a pretty decent level of versatility. It is interesting to note that all these lenses, except zoom lens, have a rather large aperture, which is excellent for low light videography. The single DJI 15mm lens you see up there is the stock lens you get with your camera. You might be disappointed to hear this, but both CinemaDNG and Apple ProRes require a license to be purchased to be used. If, however, you are coming from the professional filmmaking industry, you know this not unusual practice. Look at this way, if you do not need those formats, you get a cheaper camera. If you do need them, the additional cost is not much compared to what you will pay for the drone. In any case, thanks to the quality of this camera as well as the drone, it is not hard to imagine these costs paying off quickly. The CinemaDNG format is your choice for recording RAW footage. This format offers the highest bitrate, uncompressed video, and the most flexibility when it comes to post-processing. However, due to the huge bitrate and file size, you will need to install an SSD disk onto your drone instead of the MicroSD card. The Apple ProRes format is often the favorite choice for professional filmmakers. This is because it provides a good balance between RAW, uncompressed video and the heavily-compressed codecs such as H.264. It will compress the video just enough to avoid huge file sizes while retaining much of the quality and bitrate. Unless you need RAW post-processing or unless you want to crop and downsample your videos manually, Apple ProRes is the recommended choice for professional videography. The 5.2K video can be captured using both CinemaDNG and Apple ProRes codecs. What is especially impressive is 4K video (H.264) in 60fps at 100Mbps bitrate. Not many cameras today can boast with slow-motion 4K video. You will also be able to shoot 20.8 Megapixel DNG images at 20fps continuously. You’ll find the stills from the X5S are very sharp, clear and rich in detail. Make sure you use the DNG format instead of JPG if you want post-process your photos and be able to change things like color temperature, white balance, sharpness and noise reduction. Overall, pictures from the Inspire 2 look as good as the video. We were especially impressed with the great low-light performance. 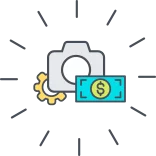 Note that while the X5S has an intelligent sensor, it still relatively small compared to full-frame sensors of DSLRs, so don’t go overboard with ISO settings as higher ISO levels will eat up your details with noise and noise reduction algorithms. If you do choose to record in 4K, you will be happy to know the 5.2K sensor will still be fully utilized. The extra 1.2K pixels will be downsampled for additional clarity and sharpness of 4K pixels. Another way to make use of the 5.2K resolution for a better 4K footage is to record in 5.2K and use software to reframe and crop your footage for a more desirable composition. The extra pixels can also be used for additional software stabilization in post-processing. While many cameras offer optical image stabilization, either in-lens or in-sensor, most have trouble with shake reduction when it comes to large focal lengths. This is understandable since the sensor is more sensitive to shakes and vibrations in a narrow, zoomed-in, field of view. The X5S handles this issue exceptionally well, especially when you consider the fact the camera is flying through the air and the wind. Even at 45mm (35mm film equivalent – 90mm), which is the maximum focal length currently available to X5S, the integrated IS manages to stabilize both videos and stills quite nicely. Of course, the 3-axis gimbal also plays a role here. Nonetheless, DJI did a great job with optical image stabilization in this camera. Another area of improvement over Inspire 1 is the autofocus performance. Not that AF in Inspire 1 was bad, it performed reasonably well. But we have noticed that Inspire 2 has even faster and more accurate autofocus. The difference is most noticeable when you try to focus by tapping on the in-app real-time video feed, or if you will, touch-to-focus. With the I1, every now and again you would tap to focus, and it would have trouble locking in. It seems this was corrected with the Inspire 2, as it manages to lock focus almost instantly when the screen is tapped. We don’t know if they improved on hardware or software, but it works great. Despite our perhaps overly enthusiastic introduction, the DJI Inspire 2 has not been completely redesigned from the ground up. It is not that different from its predecessor regarding general design language. But that’s just what we like about it. The DJI kept all that was good from the previous model and greatly improved on it. This is one of those cases where the manufacturer listens to its users. You might think we are all positive about this craft, but that’s only because when can’t find much, if anything, that’s wrong with it. The software could be improved in a few areas, but those are minor concerns. We now have the FPV camera for navigation, dual batteries which also serve as a redundancy system, refined hardware parts such as carbon fiber booms, magnesium alloy joints, aluminum-magnesium composite of the outer shell, optical collision avoidance sensors and more. 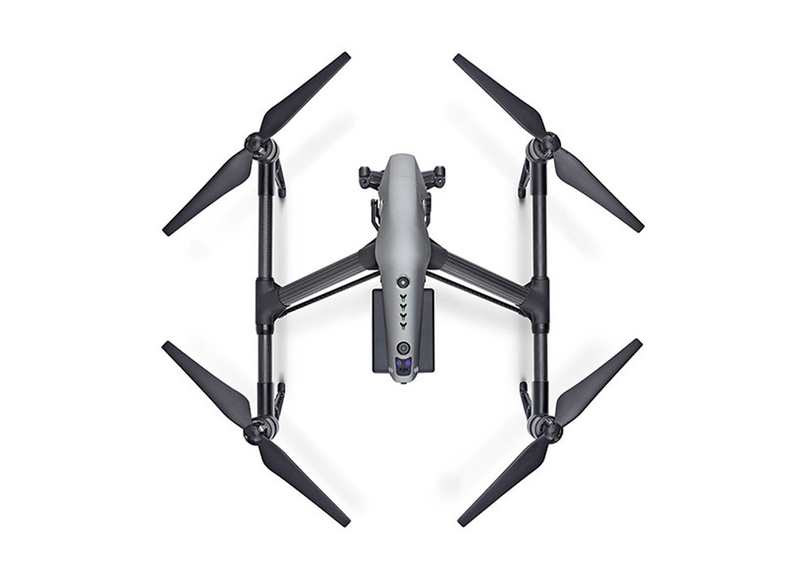 The Inspire 2 is overall improved with both better imaging and flying capabilities, expanded flight time, range and safety systems. It is a camera drone in a class of its own, without any serious competition. While it is marketed as an all-in-one filmmaking tool, if we’re realistic, that’s not the case. 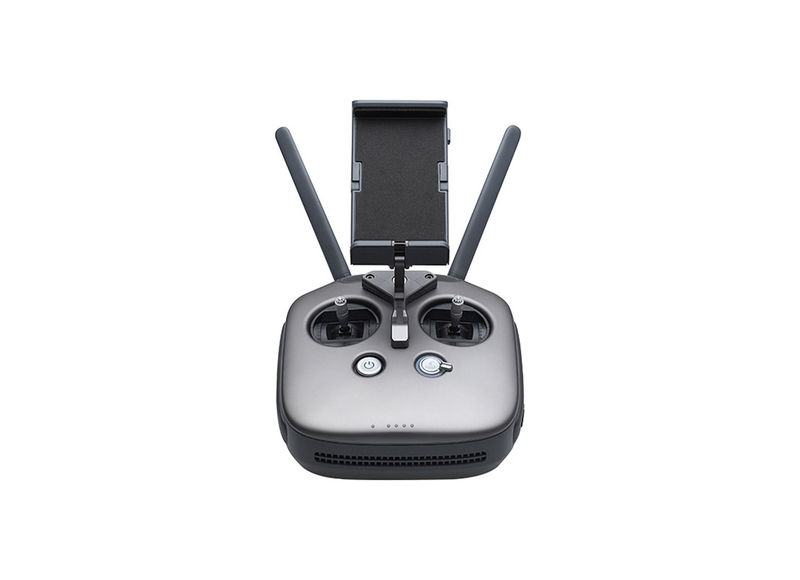 It will do great for aerial shots and even for low-altitude, narrow-space shots thanks to excellent, responsive handling and image stabilization. But the compatible cameras, while they are truly unique for this type of videography, are still limited compared to professional, standalone cameras used in professional filmmaking. We would recommend the DJI Inspire 2 for anyone interested in creating high quality, professional-looking commercial video footage also looking for a more straightforward, simple to use the system. If however, you only want to record high quality, but non-commercial or personal videos, there are better choices, both from DJI and other manufacturers. We say better options simply because the price tag on the Inspire 2 is quite high if the drone is not going to be used to its full potential.